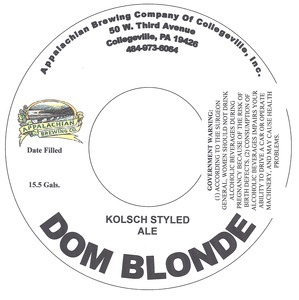 Appalachian Brewing Co Dom Blonde is brewed by Appalachian Brewing Company Of Collegeville, Inc. in Collegeville, Pennsylvania. The alcohol content is 5.0%. This brew is served on tap. We first spotted this label on May 30, 2013.